1973 saw the release of one of the most famous horror films of all time, The Wicker Man, now regarded as a classic of British cinema and a favourite of the reviewers here (one has even adopted a psuedonym from the film). Now, 39 years later, comes director Robin Hardy's long-awaited and anticipated follow-up, The Wicker Tree, which is based on Hardy's own novel, Cowboys for Christ. The Wicker Tree stars Graham McTavish (who also appears in peter Jackson's upcoming The Hobbit), Honeysuckle Weeks (Foyle's War), Henry Garrett (Red Tails), British favourite Jacqueline Leonard (Chaplin, Doctors) and newcomer Britannia Nicol, and features a guest appearance from co-star of the earlier film, Christopher Lee. A Texas gospel singer and her boyfriend, both devout evangelical Christians, are sent to Scotland on a mission to spread the word of God. After a concert in Glasgow Cathedral the pair are invited by Sir Lachlan Morrison (McTavish) to preach in his remote border village. They assume their host simply wants to hear more about the Bible and are delighted when offered central roles in the fiefdom's May Day celebrations, especially their custom of the Riding of the Laddie. But soon the horrifying reality dawns on the naïve couple as they learn the true significance of the Celtic pagan rites. 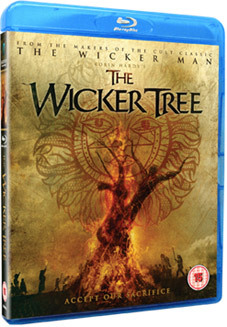 The Wicker Tree will be released on UK DVD and Blu-ray on 30th April 2012 by Anchor Bay Entertainment at the RRP of £15.99 for the DVD and £19.99 for the Blu-ray. There may well be extra features, but the press release seems reluctant to discuss this. If you are interested in seeing the film, then far and away the best venue to do so will be the Prince Charles Cinema in London on 25th April 2012, when The Wicker Tree will be screened on a double-bill with The Wicker Man, and between the two films there will be an on-stage Q&A with director Robin hardy, who will be joined by some very special guests, including, we are assured, Christopher Lee. Visit www.princecharlescinema.com for more information on tickets and prices. You'll have to dig a bit, but the info is there.